My reflection of organizing book talks when I was a Communication librarian at NTU Singapore. The highlight of my first year at NTU Libraries is the successful planning and organisation of 2 book talks featuring journalists. The first was Neil Humphreys and the second was Tom Plate. A simple email from Marshall Cavendish to the Library turned into a public talk by Neil Humphreys at the School of Communication and Information before he left Singapore for Geelong, Australia. Neil’s Tour of Singapore … in 60 minutes was held on 29 August 2006 during lunch time. More than 200 people packed the lecture hall to catch Neil. Besides staff and students from the School of Communication and Information, people from Engineering, Science, Business and Humanities and Social Sciences also made their way down to the talk. Neil shared some of the highlights of his ten-year stay in Singapore, his observations about the local media, and why he thought being a journalist in Singapore was still worth the while. We laughed with him when he mistook a void-deck funeral for a coffee-shop, when he was called Mr “Coo-Coo Bird” by his young students, and when he was nicknamed “tam pui” which means a spittoon by his ex-colleagues at the language school. Addressing the Communication students in the audience, he offered both the pros and the cons of being a journalist in Singapore. He felt that the pros outweighed the cons. For pros, he listed making a difference, enjoying perks like movie junkets, and getting ample opportunities to grow. As for cons, it would be the thin line journalists walk in trying to decide what’s acceptable and what’s not. After the talk, he spent the next hour signing books and posing for pictures with fans – his reward to fans for queuing patiently for their turn. He may be heading down to Australia in mid-September but, who knows, we might be seeing Neil back in Singapore in the near future, poking around with his pen and notepad. After all, he is now an honorary permanent resident of Singapore. After the fairly successful talk by Neil Humphreys, Marshall Cavendish came back with another author talk. This time it was Tom Plate. 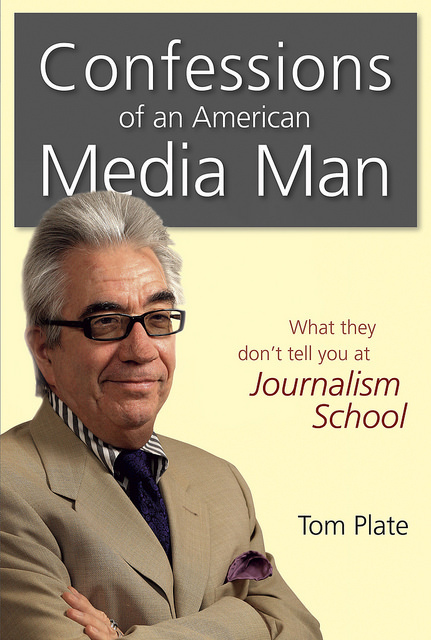 Tom is an International newspaper columnist and full-time adjunct professor at UCLA. He was in town for a week in February 2007 to promote and launch his latest book “Confessions of an American Media Man” and to conduct an exclusive interview with Prime Minister Lee Hsien Loong. Tom was notable for calling Mr Lee Hsien Loong Prime Minister Google and claiming that it is the Singapore women that are keeping Singapore ahead. The talk was held on 23 February 2007. He spoke to more than 60 attendees about what he thought of the media and the Iraq war, what it was really like to be an American journalist, and his meetings with Lee Kuan Yew, Tony Blair, Ronald Reagan and Bill Clinton. The last book talk I organised in 2012 was one of the most meaningful one. No famous author, celebrity or personality wrote “Sharing Plates: on cooking and coping with cancer“. It is a compilation of stories and recipes from a small group of cancer patients. 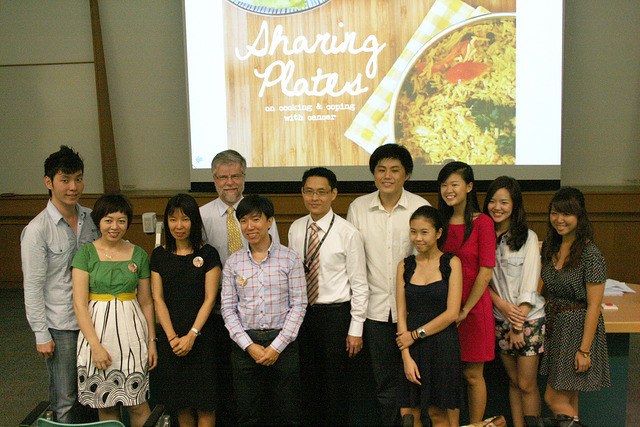 The stories were compiled and the recipes cooked and photographed by a group of final year Communication students. The topic was one that was close to their supervisor’s heart. She was a cancer survivor herself and had also contributed to the book. 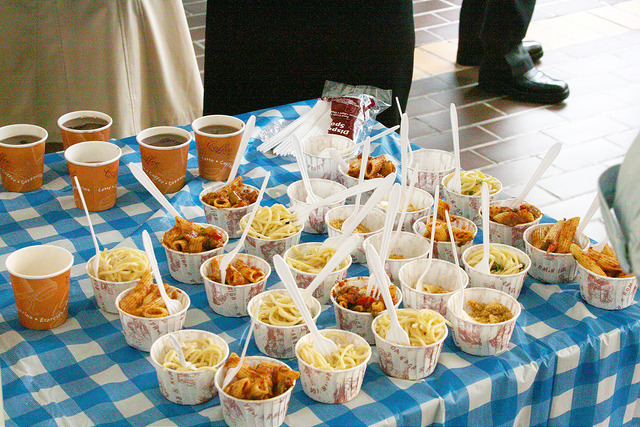 One of the most unusual part of the event was the serving of some of the food featured in the book. The students involved did a lot of the work to promote the book. It was a privilege to work with them. As I reflect on these 3 book talks that I organized, a few things came to mind. When a publisher, Marshall Cavendish, emailed us about the possibility of doing the book talk for Marshall Cavendish, my colleagues and I had never done it before. We aren’t quite sure how we should go about it. But I am glad that we were open to doing the event. Be open when opportunity knocks. Say yes first and think about how to go about it later. We worked quite closely with the authors and his/her marketing team. I tried to leverage on their strengths by finding out what they can bring to the table. I frequently find librarians giving away too much for free when working with commercial entities. In the case of the publisher, they had a good design team and can create the marketing collateral for us. The reason the publisher wanted to do a book talk is to promote their books and boost their sales. We must make sure the event has direct benefits for the publisher and their marketing agent. We must facilitate that. Offer space and facilities for book sales and book signing. This is not the territory of only the book shops. Do not forget to plan for the book signing and taking of pictures. Plan a comfortable place for the author meet the participants to chit chat and sign books. If possible, take pictures of the autograph session. This is always popular with participants. The photos taken can be used for internal reports, sharing on social media platforms to further the engagement with participants. Last but not least, send to publisher for their use. When publicizing the event, plan and draft several promotional messages for different segments of the audiences you are trying to reach. To guarantee a good turn out, it may be necessary to send personal messages.